Creation Herb Farm's New Testament Anointing Oil is made with Blood Colored St. Johns Wort Oil. The Organic St. Johns Wort Flowers are infused in Organic Olive Oil, strained and then scented with the Sweetest Healing Oil Aroma's of Lavender, Ylang-Ylang, Geranium, and Tangerine from God's Creation. These exquisite aroma's symbolize the reality of God's Grace on us, our healing, our lives, and our world when we receive the blessings by confessing our faith and claiming the blood of Jesus Christ as a covering over our lives. Creation's New Testament anointing oil is for calling the Elders to anoint with oil the sick in the name of the Lord, in conjuction with prayer and the laying of hands. The Healing power is not in the oil but in the anointing of the Holy Spirit that comes when we are obedient and follow God's instruction and show our faith by acting on his direction. John 12:3 "Then took Mary a pound of ointment of spikenard, very costly, and anointed the feet of Jesus, and wiped his feet with her hair: and the house was filled with the aroma of the ointment." In addition to being a staple in every Christian home, the New Testament Anointing Oil is the perfect gift for anyone following God's calling including all Ministry, Clergy, Missions, Lay Ministry, Teachers, Prophets, Apostles and all other disciples actively pursuing the Kingdom of God. 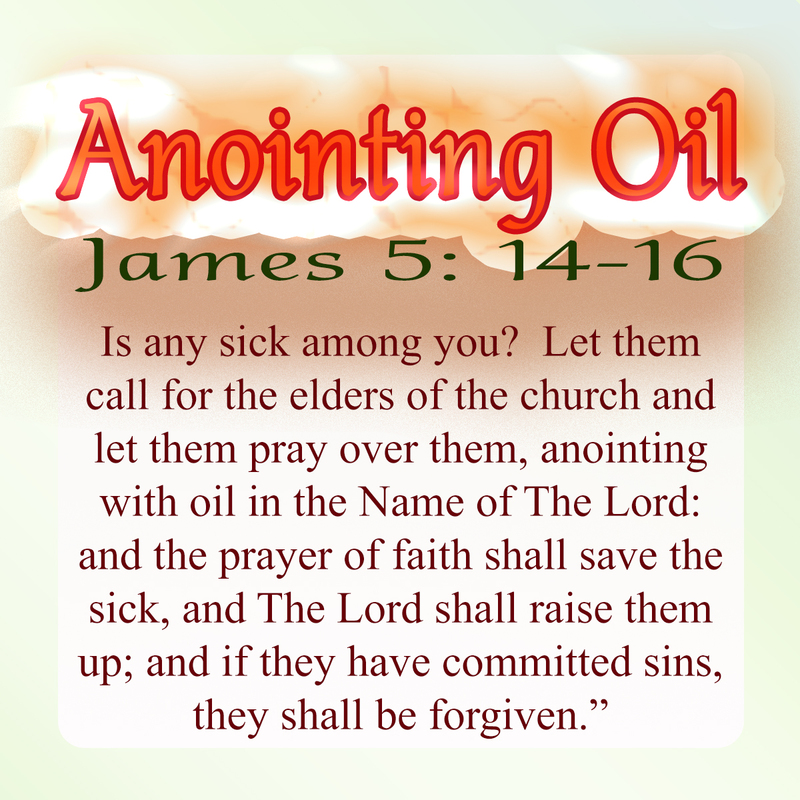 New Testament Healing Scriptures: James 5:14-16, "Is any sick among you? Let him call for the elders of the church; and let them pray over him, anointing him with oil in the name of the Lord: and the prayer of faith shall save the sick, and the Lord shall raise him up; and if he have committed sins, they shall be forgiven him." Information regarding Catholicism and anointing oil: This is from the Sacraments of Healing as taught in the Catechism of the Catholic Church; The sacrament of Anointing of the Sick is given to those who are seriously ill by anointing them on the forehead and hands with duly blessed oil - pressed from olives or from other plants - saying, only once: "Through this holy anointing may the Lord in his love and mercy help you with the grace of the Holy Spirit. May the Lord who frees you from sin save you and raise you up." Unlike most of the anointing oils sold in the modern world. Creation's New Testament annointing oil does not contain the herb combination that we were all warned against using in the same combination mentioned in Exodus 30. It specifically warns in this scripture that there are negative consequences for those that make or use that specific holy oil for any other time or purpose than the lord instructed its use for that day. It also warns in Exodus 30 that the oil recipe in that scripture was not to be used on the skin of any man.